Are you wondering about what might be involved with making an application work with IPv6? Do you develop apps and haven’t given much thought to IPv6, but are thinking maybe you should? Or are you an advocate for IPv6 looking to understand what books are out there? 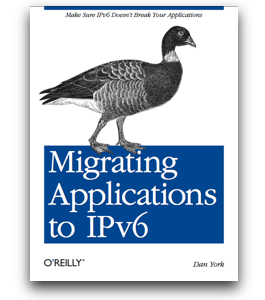 If you answered yes to any of these questions, would you be interested in reviewing my latest book, “Migrating Applications to IPv6“, published by O’Reilly in June 2011? The reality of today’s book marketplace is that reviews sell books. People do make purchasing decisions based on reading the reviews that people write. Right now there’s only 1 review of my book on O’Reilly’s site and none on Amazon.com. I’d love to see a few more out there on those sites… I’d also love to see some independent reviews on blog sites. The other reality is – I would like feedback! I’ve had some great comments from some friends who work with IPv6, but I’d like to get more feedback. Is the book appropriate for the target market? Is there anything more you’d like to see in the book? Were there sections that you felt could have had more text? 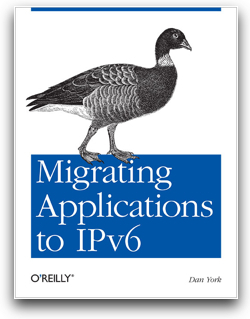 So in my mind I would like to see this book be an ongoing compilation of “best practices” around migrating applications to IPv6. I already have some ideas for additions… but I’d like to hear from others. If you are interested in reviewing the book, please drop me an email and include in your message the email address you use at members.oreilly.com (and if you don’t have an account you can sign up for free). I will then pass your info along to O’Reilly and they will drop a copy of the eBook in your O’Reilly account. You can then download the book in the format of your choice: ePub, Mobi (Kindle) or PDF. All I would ask is that in return you post an honest review of the book somewhere on the web… O’Reilly’s site… Amazon… your blog… some other site. Note that I’m not just asking for glowing reviews… sure, I love those and they help… but if you don’t like the book or think it has issues, I want to hear that feedback, too! At this point my main interest is in seeing some more reviews out there. This server has received 4034677 hits from both ipv4 and ipv6.